Giveaway number 16. Relax in bed and instruct your other half to bring your this indulgent breakfast in bed. I am sure after Christmas you will deserve it. This hamper comes from Whisk Hampers. "Whisk Hampers is a gourmet gift company with a wonderful contemporary twist. Dedicated to sourcing gorgeous, delicious and mouth-watering products for the food savvy, our collection of stylish hampers and food gifts are the ideal choice for the modern foodie. From Champagne, Caviar and the finest Armagnac to Real Ale, Gardening Hampers and even Breakfast in Bed hampers for the romantics of the world, our gorgeous gifts are the perfect present for the most important people in your life." A delicious, easy drinking, lightly sparkling style of Prosecco with a nose suggesting blanched almonds, white flowers and pearskin; the palate is soft and clean with apple and quince fruit flavours and a naturally off-dry finish. A most pleasant aperitif, it would be perfect with antipasti and desserts alike. Would you like to win this hamper? 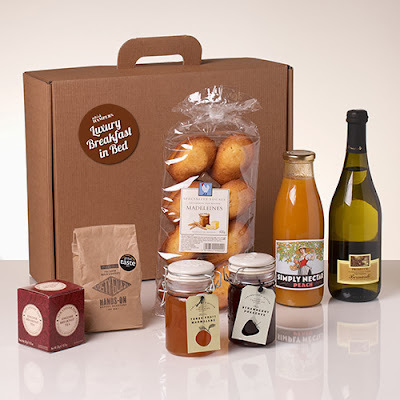 Just leave me a comment telling me about your perfect weekend breakfast and then enter using the rafflecopter box below. This giveaway is UK only and runs until 2 January 2014. The winner will be announced on 3 January 2014. Disclosure: Whisk are holding a prize for the winner of this giveaway. I have not received any goods or payment. I was not expected to write a positive review and any opinions expressed are my own. Honey on wholemeal toast and homemade porridge! My perfect weekend breakfast would have to be fresh fruit, yoghurt with honey and some toast, followed by a strawberry iced smoothie...mmM! Homemade seville orange marmalade on toast! Porridge with berries and a drizzle of honey. We alternate between fresh croissants that Pete goes and buys from the local bakery and a cooked breakfast! I love both! Scrambled Eggs, Bacon, Sausages, Baked Beans, Mushrooms, Black Pudding, Toast, Hash Browns! American style pancakes with sausage slices inside and maple syrup NOM! Scrambled eggs on sourdough served with a big mug of coffee and catching up with the weeks tv. My favourite weekend breakfast is really strong coffee and veggie bacon on fresh, floury rolls with lots of tomato sauce. Eggs Benedict, but only if someone else makes it for me. I can never get the egg right! Perfect breakfast would feature some form of bread probably - French bread, jam and butter. I did manage a macaron one morning in Paris - that was amazing! Eggs Benedict, pastries, fresh juice & machine coffee. Full english , a rare treat made by my Mother-in-Law when we visit. Eggs scrambled with tomatoes, and bacon! Poached Egg on Wholemeal Toast. porridge and a bacon sandwich. A full english breakfast with time to drink loads of tea and read the papers! oops, forgot to say i love french toast for breakfast! Granary toast with marmalade and a nice hot cup of tea. Rachel Khoo croque madames - yum yum yum! Eggs benedict with some top quality ham or an omelette packed with veggies. Eggs Benedict. Making me hungry just thinking about it. Homemade ham and egg muffin - really cheap and only 305 calories! Perfect weekend breakfast would be a full English breakfast, freshly brewed tea, hot buttered toast. Cosy in my house with my totes toasties on my feet and the fire on!! Bliss!! Waffles with maple syrup and ice cream. Naughty i know. I love a full British breakfast. My perfect weekend breakfast is a bowl of fresh tomato soup with cheesy croutons - unconventional, I know! I love tomato soup and it just seems like a perfectly reasonable breakfast food to me now! I love a fully loaded omelette with hashbrowns! Poached eggs and mushrooms on buttered sourdough toast (or crispy potato waffles), a mug of Lady Grey and a glass of OJ. But the best breakfast I've ever had was Dumb Huevos at the Dumb Waiter in Brighton - sautéed potatoes, peppers, onions and veggie 'chorizo' with poached eggs and salsa. Cripes. American pancakes with bacon and maple syrup are our weekend breakfast treat! A lazy brunch of Omelette Arnold Bennett and a big mug of English breakfast tea! A nice crispy bacon roll is delicious. Scrambled egg on Staffordshire Oatcakes - Yum! My favourite weekend breakfast is the full works: sausage, bacon, egg (fried! ), toast, beans, tomatoes and mushrooms. I don't have it every weekend but when I do, it keeps me going all day! It has to be a full English fry-up. Reluctantly i omit the fried slice, but i do love it. Poached eggs on a buttered, toasted English muffin. Same as on weekdays, it has to be porridge. veggie sausage, beans, mushrooms, hash browns, toast. qi do like a grapefruit with my breakfast. Porridge with a drizzle of golden syrup. Double Egg, Bacon and 2 Sausages, Toast and plenty of Tea. Pancakes with bacon and maple syrup. A treat is to go out for a cooked breakfast - totally indulgent! poached egg on toast with a sprinkle of pepper! a veggie fry up, or brunch, minus beans and eggs well done! Scrambled eggs, oven baked Portabello mushroom and toasted white soda bread. Got to be a full english! Fresh waffles with maple syrup! orange juice, and scrambled egg on wholemeal toast.